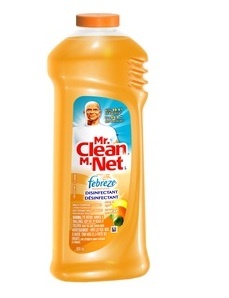 I found two Mr. Clean Coupons on Brandsaver’s website. Visit Brandsaver.ca, select the Mr. Clean coupons, create a free account with Brandsaver and claim your coupons. You must select between 4-32 coupons before they will process your order. So after you get your coupons and account setup, get your coupons mailed to you asap because they take between 3-4 weeks to reach your mailing address. 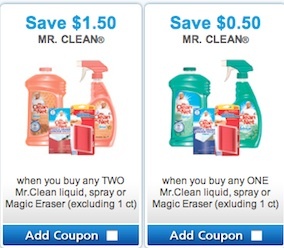 These are two Mr. Clean coupons to save $1.50 when you buy any TWO Mr.Clean liquid, spray or Magic Eraser (excluding 1 ct) and Save $0.50 when you buy any ONE Mr.Clean liquid, spray or Magic Eraser (exluding 1 ct). Bacteria can hide on any surface in your home, but the floors tend to have the tough messes that are the hardest to tackle. Getting rid of bacteria, however, doesn’t mean that your home needs to smell like harsh chemicals thanks to the cleaning power and freshness of the new Mr. Clean with Febreze Freshness Disinfectant liquid cleaner. With a disinfectant that kills bacteria and helps eliminate odors with Febreze freshness, your surfaces will be left clean and smelling fresh after every use.